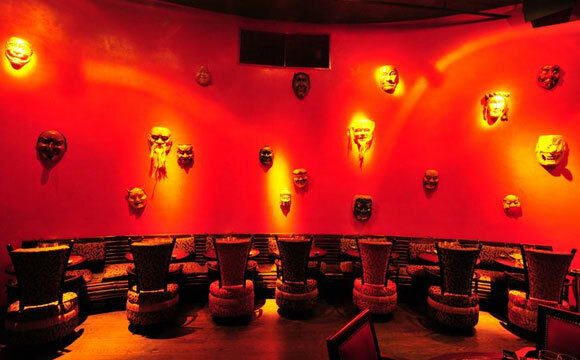 Formally known as Buddha Bar, Ajna is an Asian-themed night spot where you can finally step outside of the traditional nightclub scene. 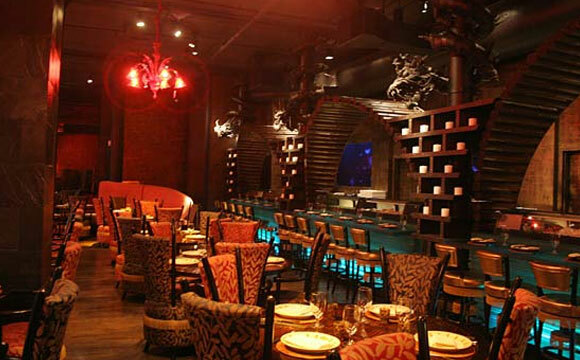 Intriguing decor, worldly beats, and exquisite cuisine will be sure to stimulate all of your senses. Located on the West Side of Manhattan in what is known as the Meatpacking District, Ajna attracts a fun and adventurous crowd. 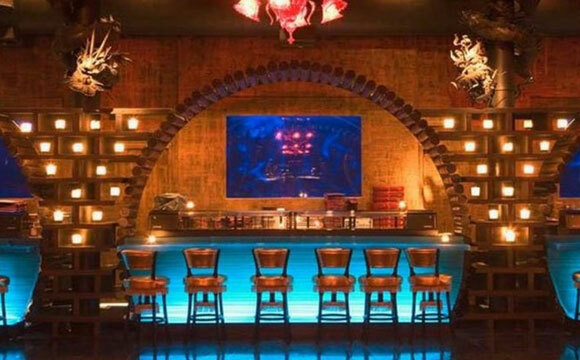 On Friday and Saturday nights, Ajna comes alive, drawing in a diverse crowd of locals and out-of-towners. In Manhattan, a large crowd usually means long lines. With Bachelor Party Bay, you can skip the line and proceed straight to the fun stuff! The entrance of this club alone is an experience in itself. 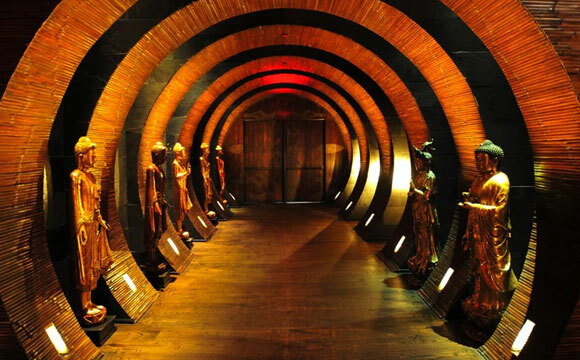 Beginning with a set of towering stone castle doors, you are taken through a dimly lit tunnel of bamboo lined with golden Buddha statues. As you walk through the tunnel, you forget about the bustling city streets from which you came and are transported back in time to what resembles a nineteenth century opium den. At the end of the tunnel the club opens up into a series of elaborately decorated cavernous rooms for dining, lounging, and dancing. The first room you enter is a spacious dining room with a fifty-foot high glass ceiling. 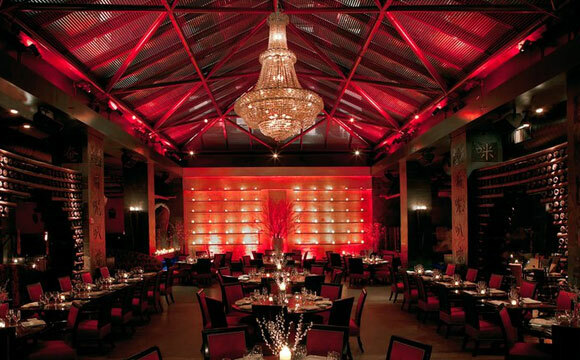 The skylight ceiling allows the lights from the skyscrapers above to mesh with the sensuality of the candle light and red tinted chandeliers inside. You are greeted by exotic tunes from a DJ stationed at the front of the restaurant. The DJs here do a great job setting the vibe by mashing up unique world music with energetic house beats. The music selection will definitely get you in the mood boogie and you will notice a lot of other people feeling the same way. You will want to make a point to try some of the creative and exotic dishes served up by Ajna's kitchen. A full menu of entrees and appetizers gives you dozens of options to experiment with the world-renowned, Asian-inspired cuisine featured at Ajna. The generous portions and reasonable prices are sure to satisfy your late night food fix. The combination of bold Asian flavors with a hint of French culinary craftsmanship gives you a dining experience you won't soon forget. Sushi fans are always attracted to the elegant sushi bar with hibachi style chefs skillfully whipping together some of the best sushi creations in the city. A mesmerizing tank of jellyfish hovers over the sushi bar, hypnotizing guests as they wait for their order. The lounge area is attached to the dining room and presents a nice alternative area to change up the scenery. The room is arranged with sofas and small tables and is a great spot to mingle with some friendly faces. There are often dancers dressed in unique attire performing in various spaces around the room. The lounge serves as a kind of all-purpose room for drinking, dancing, and socializing. The way the couches are arranged allows you to sit with your group, but you are still close enough to other parties to converse. In the center of everything is a glass-walled smoker's area where you can step outside and enjoy a smoke. We aren't condoning smoking, but you would be surprised how well the words "do you have a light?" can lead to a rewarding conversation. Side note: if she smokes, she pokes! There are a couple of bars within the confines of the club that offer amazing service. The bartenders are efficient, knowledgeable, and friendly. Top shelf liquors and craft beers are available as well as some of Ajna's signature cocktails like the heavy favorite "Black Buddha"; a tasty alcoholic concoction of passion fruit and mango vodkas with pineapple and pomegranate juices. Bachelor Party Bay can hook you and your friends up with open bar passes so you don’t have to worry about fidgeting through your wallet every time you approach the bar. SAKE! SAKE! SAKE!!! If you're a fan of the obnoxiously entertaining drinking technique known as sake-bombing, you will be happy to hear that Ajna offers hot sake to fulfill your sake-bombing needs. Sake is an Asian alcohol made from rice. If you are unfamiliar with the game of sake-bombing, Ajna is the perfect place to start. The game is played by balancing a shot of hot sake on two parallel chopsticks laying over the rim of a pint glass filled half way with Japanese beer (Sapporo is usually the preferred beer). Everyone at the table shouts the sake chant (or a good old-fashioned countdown from three) and simultaneously pounds their fists on the table. The cups of sake are shaken from their perch and splash into the beer. Sake-bomb. Drink up! Pointless? Perhaps. But anyone who has ever participated in the sport will tell you sake-bombing always leads to a memorable night. Since you are booking a VIP party with Bachelor Party Bay, you will get the full experience of everything Ajna has to offer. Bachelor parties booked through Bachelor Party Bay are held at snazzy private tables that are raised with glass floors. Fully serviced by Ajna's friendly staff, you and your guests will have the entire club at your fingertips. Contact Bachelor Party Bay and book your VIP bachelor party at Ajna today!